« New Self Storage Facility in South Waterfront - Now OPEN! 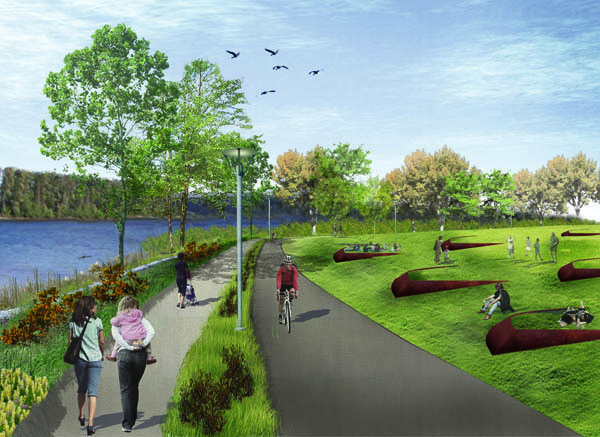 Construction on a $9.5 million South Waterfront Greenway may start this July. Portland Parks and Recreation has began the permit process, and they expect to know by June for both city and federal permits. This portion is called the central district phase and is just five blocks of separate bike paths, lush picnicking area, and a gravel beach. Portland Parks and Recreation was able to secure $7.8 million in funding so far. Funding came from TriMet, The Portland Development Commission (PDC), and private developers. Parks and Recreation is facing a budget shortfall this year and expects to layoff staff and cut expenses, however they still plan to move forward with this decade long project. Mike Abbate, Parks and Recreation director says,"I know that when you look at the kinds of cuts we're going to need to make, it may seems interesting that we're doing some new projects." And he continued, "But the plan [greenway] precedes the economic downturn; it's a been in the pipeline for many years and it's funding sources are not flexible." The project is a great start to the South Waterfront Greenway and cleanup.